It really troubles you when Syncios has no rights to write your external SD card so the backup & restore of which become difficult. 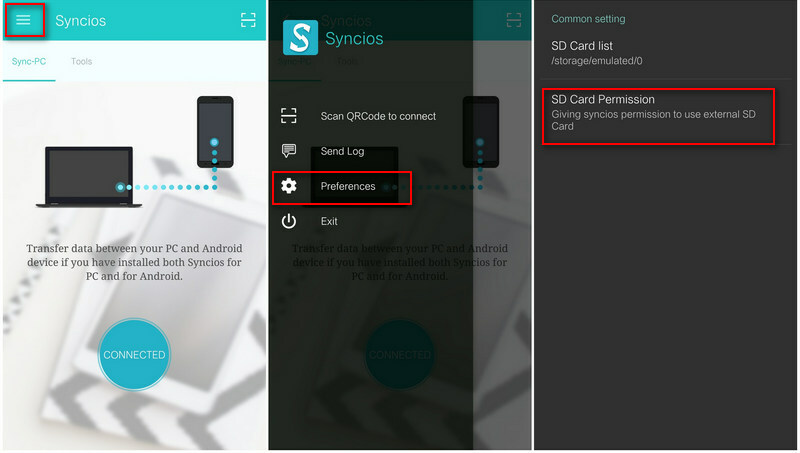 Now please follow this simple tutorial to authorize Syncios app to write your external SD card on devices with Android 5.0 Lollipop and above version. Step 1 Launch Syncios app on your Android device. Step 2 Click Menu button in the cornor. Go to "Preferences". Step 3 Click "SD Card Permission", find Settings button on the right. Step 4 Choose "Show SD Card" under Settings. Step 5 Click button to back to "Open from" interface, then choose "SD Card". Step 6 Click SELECT "SD Card". Now you have successfully authorized Syncios app to write your Android smartphone SD Card. If your app interface is different from the above screenshots, please make sure you have the latest Syncios mobile app, otherwise you can download from here. 2. How to fix the Android device detection problem?